The final countdown is upon us fanboys & fangirls, the moment we’ve been waiting for since childhood: the Justice League will be on the big screen in one week! I am here to encourage peace before the chaos commences. DC community, respect your fellow fans. If your enthusiasm does not match that of someone else, please leave them alone and allow them to be happy. Marvel community, please don’t turn this into a war. No two fans are alike, but we all have one thing in common: we LOVE superheroes! I think both the Avengers and the Justice League would want us to be united, not divided. I am personally very excited and refuse to let anybody or anything to ruin this experience which is why I’m turning off all social media starting November 14th. I will be avoiding petty comments and reviews until I see the movie on the 16th because I want to form my own opinion without outside influence. If you’re not already jumping out of your skin with excitement, GET ON MY LEVEL! Today I am reviewing products from Anthology Candles, a company owned by Rheney Williams and her husband Stephen. Their soy products are whimsically inspired by music, movies, & books. Keep reading for information on their candles, mini candles, & wax tarts. My Youtube review video will be posted at the end for those of you who want to see the products in action. The top white layer is clean river water; the middle lavender layer is a floral blend; and the bottom purple layer is a mixture of flowers & water. There is no need to burn the candle down to smell each layer; it immediately smells clean and floral. If you like strongly scented candles that fill a room within minutes, this is not the product for you. It took an hour for me to smell the scent, and even then I had to remain within a foot or two to enjoy it. Once it is burnt, the candle’s scent is hidden by the smell of burnt wick. As time goes on, the scent comes back and gets stronger. The draw of this candle is definitely the aesthetic. The design, inspired by the lantern scene in the Disney film Tangled, is spot on. The white wax becomes transparent when burning and makes the candle appear as though it is a lantern. The effect is mesmerizing! If you are planning a Tangled party, think about investing in these candles and creating your very own “Floating Lanterns” scene. Instead of purchasing more big candles, I got a sampler pack of four mini candles. Belle’s Library is aged library books, hint of leather, & wild roses. To me, it smells nutty with a hint of rose. My nose is obviously confusing the smell of old books for nuts. I don’t know of any other way to describe it. It just smells nutty! Mad Hatter’s Tea Party is bakery cakes with vanilla icing, chamomile tea, and a twist of cinnamon. I do smell cinnamon and occasionally vanilla but mostly an icee. I know that sounds crazy but it’s true! Part of Your World is crisp coastal breeze & warm golden sand. I smell a blend of vanilla & flowers, and the strength of the scent reminds me of Bath & Body Works products. Tink’s Flight is fresh verbena, sweet coconut, & tangy lime. I smell every single one of those notes. The scent is sweet & sour just like Tinker Bell. Time for the bad news. The wicks are folded down in the packaging so when it comes time to light them, zip zilch NADA! I had to trim the wicks a little bit and wipe them gently with a paper towel; I wasted a lot of matches before finally getting flames. Once lit, the candles look pretty but don’t smell at all. These sampler candles are fine if you plan on testing the scents without flame. It might be a better investment to know what scents you like and buy a few big candles. * Note: Wax tarts are cubes of scent-infused wax. Once placed in a warmer (e.g. Scentsy), the heat melts the wax and releases the scent. I bought one sampler and received four different wax tarts. Rivendell is amber, oakmoss, twilight woods, & woodland foliage. I wish I could tell you that my dream of being a Middle Earth elf was fulfilled by this product. Alas, it smells like play-doh, and the warmer is no help at all. However, due to circumstances I cannot explain, the scent is improving. There is hope yet! Soaring Over is orange blossoms, orange groves, and salty sea breeze. The scent is inspired by the Disney park ride Soaring Over California. It smells of oranges and takes me right back to my childhood in Orange County. The Black Pearl is cannonball smoke, mildewy wood, musty “pirates” water, & salty sea breeze. I did not like this funky scent at first. All you smell is must, mildew, and smoke. Surprise of the year, it smells much more pleasant in the warmer. If you aren’t into scents that are clean, floral, and/or sweet, this scent might float your boat (get it?!). Wilderness Lodge is campfire and a forest tree mix of juniper, pine, & spruce. This spicy forest scent will be p-e-r-f-e-c-t for Christmastime. Overall, I am very happy with the scents I purchased. However, much like the candles, it takes an hour or more for the scent to be recognizable, and it does not fill the room; you have to be within a few feet of the warmer to enjoy the scent. 1. The candles and wax tarts are best enjoyed in close proximity (e.g. bedside table or living room side table). 2. I have seen the candles used as decor all over Instagram, especially on bookshelves. My overall experience was good. There are only a few changes I would suggest. 1. There are descriptions on the website for the candles but not the wax tarts. This works out fine if the wax tart happens to have a candle, but if it doesn’t, there is no way of knowing what the scent is. Also, the packaging gives no indication of the scent. 2. The mini candle sampler packs are not customizable. There are three packs available, each with a set group of candles. I am not sure of the possible complications, but it would be nice to have a customization option in the future. 3. The wax tarts can only be purchased in groups of four. Once again, a customization option would be nice in the future. 4. These products would be much more enjoyable and worth the money if the scents were stronger. *Note: There were a number of contestants unable to be involved in the Idol finale. Some of those absences were disappointing, but it must have been a nightmare trying to organize so many different people and schedules into two hours of television. I am squelching my feelings and focusing on the positive in this post. Going into the Idol finale, I knew I would be emotional, but I didn’t realize the tears would fall so soon. Familiar faces from past seasons appeared during the opening song, and the floodgates were open. In that moment I buckled my seatbelt and prepared for a two-hour storm of nostalgia. The majority of the show was dedicated to a flow of performances by contestants and judges. I really like that the contestants were mixed rather than organized by season. It was fantastic to hear duets and groups that I would never have dreamed of seeing perform. Even Larry Platt (“Pants on the Ground”), Sanjaya Malakar, and William Hung made an appearance. I died from laughter when I realized Sanjaya was moving around the audience and wearing different wigs. 😂 Of course the original judges had to make an appearance: Paula, Randy, & Simon, the trio that started it all. Judges come and go, but they will always be the most memorable panel. I noticed that the current judges were very emotional throughout the night. It’s hard to say goodbye to the show, but I think it had more to do with the slew of past contestants & winners making an appearance. This show has been on the air for 15 seasons, and the numerous performances proved that more times than not, the judges and voters got it right. Not every contestant made it to the pinnacle of fame, but they are spread out all over the world of music sharing their unique gifts. Last but not least, America found out who the final “American Idol” is. The winner is… Trent Harmon!! Even though I was rooting for La’Porsha, Trent is incredibly talented. I wish both of them nothing but the best. I believe both of them can go very far in the music industry. *Note: The videos that are missing will be posted once I find them on Youtube. I didn’t start watching this show until season 6, but it impacted my life long before then and continues to do so. I have owned Chris Daughtry, David Archuleta, David Cook, Kelly Clarkson, and Lee Dewyze CDs. My ipod playlist has included Angie Miller, Carrie Underwood, Colton Dixon, Jason Castro, Jordin Sparks, Kris Allen, and Phillip Phillips. My diary (2006-2014) is full of “American Idol” predictions & celebrations. I still own Kelly Clarkson’s album “Breakaway” on CD. Over the past decade, I have played that thing to death. Watching Kelly’s medley tonight, I was reminded of just how talented and special she is. She was a huge part of my childhood, and I will forever be grateful that she took a chance and auditioned for a brand new reality competition TV show. Farewell American Idol!! Your legacy lives on in the careers of the numerous stars you have produced. I am going to try very hard to get these words out without becoming overly emotional and rambling. I apologize for the serious note of this post, but my heart is telling me to write. Because of the picture, you already have a basic idea of what I am going to discuss. I have watched quite a few Holocaust-related movies but am not sure why because it is very hard for me to do so. I suppose that as a Jew I feel a strange sort of loyalty, a loyalty that urges me to watch and empathize to the best of my ability. I did not experience a concentration camp nor did my Sephardic ancestors. However, Jews are brothers and sisters no matter the category one belongs to (Ashkenazi, Mizrahi, or Sephardic); after all, we all descend from the same bloodline. I cannot speak for other Jews, but I can speak for myself. When another heart hurts, I hurt, no matter how far back in history that hurt occurred. 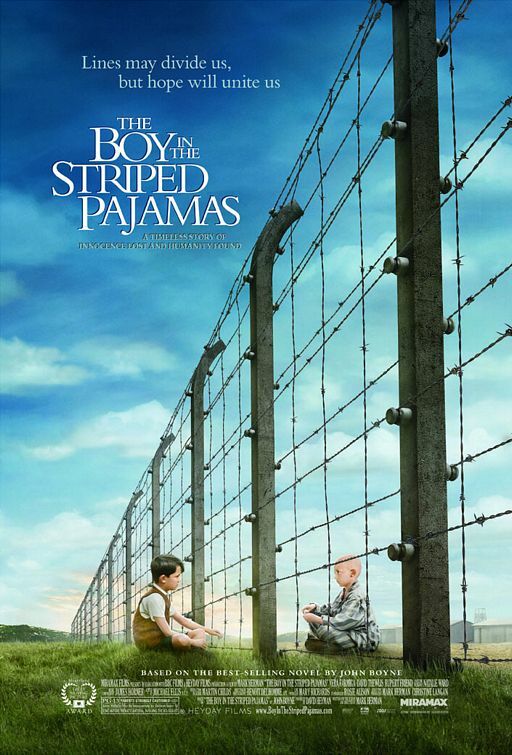 I have been emotionally disturbed by Holocaust movies in the past, but this film wrenched my heart to the point of illness. As soon as the credits started to roll, I ran away from my computer and wept alone in another room. My head throbbed, and my stomach was in knots. I do not pretend to have felt pain anywhere near that of the Jews in concentration camps, but I did indeed feel pain. Pain and anger. I could not speak, only weep. One word kept coming to mind over and over and over again: Why. Why? Why?? Why??! Why!!! There is one specific element in this movie that grabbed my attention. It is subtle but very much significant. When Bruno is mistakenly taken with a group of Jews to the gas chamber, the Nazi soldiers do not question his presence. Yes he is disguised, and yes he is surrounded by numerous other Jews, but take all that away. Cut off Bruno’s hair. Take away from Shmuel the dirty appearance and malnutrition. Line them up side by side in matching “striped pajamas.” They are two young boys, same age and same height. Shmuel could be German. Bruno could be Jewish. Both could be one or the other. It is unclear whether Bruno was visible to the soldiers, but he looked just like everybody else therefore he received the same treatment and tragic death. He was one of them, a German, and yet the soldiers could not tell the difference. What does that tell you about prejudice? Hatred will show you what you want to see, not what is actually there. If you think your contribution to the fight against prejudice as one person is too small, think again. Love goes a long way no matter the number of contributors. I will end with some lyrics from a song called “Let It Be Love” by Family Force 5. I encourage you to read the words, click the following link to hear the entire song, and take time to reflect. Please don’t pick and choose who to love. Love everyone!